Throughout this rain and snow-fraught summer, there have been several creative initiatives to mark the centennial of the first ascent of Bugaboo Spire, one of B.C.’s most iconic peaks. Only one confirmed team of climbers reached the top on the actual anniversary, August 29. 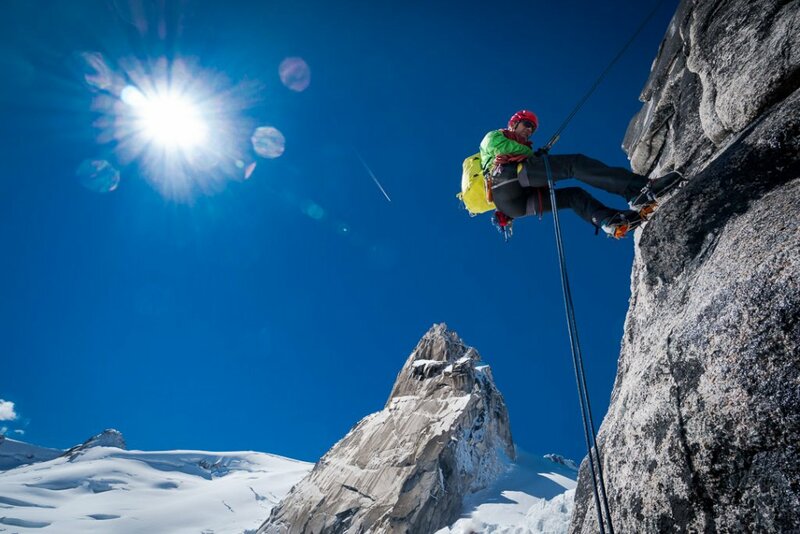 ACMG guide Marc Piché (co-author of the climber’s guidebook, “The Bugaboos”), and three teammates braved the inclement weather that day to nail the century milestone. Just a week later, Marc was one of four mountain guides to join the Alpine Club of Canada’s celebratory camp from September 8-13 at the Conrad Kain hut, named to honour the Austrian immigrant who led the first ascent of this technically difficult spire and 14 other mountains in the Purcells and Rockies in the summer of 1916. Thirty five representatives of the Alpine Club of Canada, the New Zealand Alpine Club, the Association of Canadian Mountain Guides, the Conrad Kain Centennial Society and BC Parks converged on the hut which has seen almost full capacity all summer. ACC Executive Director, Lawrence White observed that, “The diversity of groups and individuals involved in celebrating Kain’s accomplishment is a testament to his legacy and impact on Canada’s mountain culture. People of all ages from 5 to 85 came together to celebrate a truly historic landmark; it’s a fantastic story”. The ACC also hosted five alumni from the Conrad Kain Centennial Society’s Bugaboos Teens climbing program. From the CKCS’s point of view, this was the perfect opportunity for a handful of its alumni, dating back to the first climbing camp in 2009, to have another chance to try for the summit of Bugaboo Spire. In previous years, including this July, we have managed to lead youths from the Kootenay/Columbia region to the tops of several of the minor peaks, but Bugaboo Spire has eluded us due to poor weather conditions. The weather this autumn was no exception. An early snowstorm plastered all of our rock climbing objectives, but our guides were still able to take us on roped adventures across the Bugaboo and Vowell glaciers and to the tops of Hounds Tooth and Eastpost Spire in marginal conditions. And equally rewarding, if not quite as rigorous, was the chance to hear wild-eyed yarns from climbers and guides who are intimately familiar with the granite spires that Conrad and his companions first explored on foot and horseback. Philosophically, not reaching your goal can provide almost greater rewards. Exploring wild and remote places can foster a profound love of nature and bring purpose and richness to one’s life. By getting out there, rain or shine, we forge a respect for our small blue planet and are often inspired to raise awareness about its fragility. Special guests, Canadian Mountain Holiday Bugaboos legends Leo Grillmair, Lloyd “Kiwi” Gallagher, and Philippe Delesalle, whose combined ages add up to 250 years of living life to the fullest, and Chic Scott, silver tongued mountain historian and author, provided hours of evening entertainment. As a fitting finale to the camp, Laurie Schwartz and David Thomson of Banff National Park’s Mountain WIT program staged their ever-popular Conrad Kain play “As Far As I Can Take You”.